Members of the BRICS bloc voted in Geneva on Wednesday in favor of a Palestinian draft submitted to an emergency session of the UN Human Rights Council (UNHRC) to investigate alleged war crimes committed during Israel’s assault on the Gaza Strip. Brazil, Russia, India, China and South Africa were among 29 countries in the 46-nation Council which voted for the resolution titled “Ensuring Respect for International Law in The Occupied Palestinian Territories including East Jerusalem”. The US voted against the resolution while 17 other mostly European members abstained. UN High Commissioner for Human Rights Navi Pillay said that Israel’s attacks which have killed more than 690 people, including many women and children, in recent weeks could be considered war crimes. “There seems to be a strong possibility that international law has been violated, in a manner that could amount to war crimes,” Pillay said of Israeli attacks on the Gaza Strip. Pillay also strongly condemned the firing of homemade rockets indiscriminately into Israel, adding that Israeli children and other civilians also had a right to live without constant fear of rocket attacks. But the office of the Israeli Prime Minister Benjamin Netanyahu criticized the Council’s decision saying that it should be Hamas that is investigated for allegedly using Palestinian civilians as human shields. “The decision today by the HRC is a travesty and should be rejected by decent people everywhere,” Netanyahu’s office said in the first official Israeli response. The Prime Minister’s office also said that the Israeli military had taken unprecedented steps to minimize civilian casualties by taking measures such as dropping leaflets and warning via phone and text messaging of an impending attack. But international criticism of Israel’s military campaign has been steadily growing as the death toll increases. Non-permanent members Argentina and Chile told the Security Council on Wednesday that they strongly condemned what Buenos Aires’ ambassador called Israel’s indiscriminate abuse of militarism. 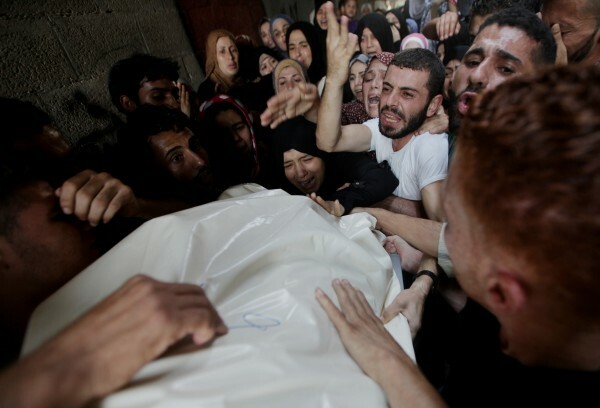 On Wednesday, the death toll reached 690 Palestinians and 35 Israelis. Palestinian medical sources said that more than 4,250 people have been wounded in the Gaza Strip since July 8. Of course USA and Israel would be against it. They’ve been feeding PROPAGANDA to the world about their ‘so-called’ innocence when in fact their UNITED NATIONS (which the people never voted for) are pushing for unrest and their One World Order (including depopulation). The PEOPLE are SO SICK of the false flags (they don’t even do that right anymore) and it needs to STOP. Humanity killing humanity due to political BRAINWASHING is complete b.s. There is a mountain of the most incontrovertible evidence linking Israel and it’s Mossad to the management and execution of the 9/11 event (Mossad members on Israeli TV admitting there were ‘only there to document the event’ and that is still there to see on You Tube…the ‘5 dancing Israelis’)that the only conclusion one can seem to draw is that Israel will nuke the U.S. somewhere if we and our allies ever go in and ‘find their weapons of mass destruction and manage their military”. It needs to be done because Israel is a sanctuary for the Anglo American rothschild Zionist banking empire. Any moves against our ‘gallant little ally’ that Rothschild created could result in a spike in interest rates and the immediate calling in of huge loans. Are you scared of them? I am not scared of them. I saw them take over Key West, Florida commercially starting in 1990. I left. Most U.S. Jews seem to hate the Zionist Israelis… refer to Rabbi Dovid Weiss and Naturei Karta.